We provide relevant research and expert insight to assist organizations and stakeholders. We prepare publications on trends and topics in our areas of expertise and publish studies on topics relevant and of interest to our clients. Notably, since 2010, our quarterly “Summary of Accounting and Auditing Enforcement Releases” has become a recognized industry benchmark for reporting on the major items disclosed in the U.S. Securities and Exchange Commission, Division of Enforcement’s Accounting and Auditing Enforcement Releases (AAERs). Summary of the U.S. Securities and Exchange Commission, Division of Enforcement’s Accounting and Auditing Enforcement Releases (“AAERs”) for the Year Ended December 31, 2018. 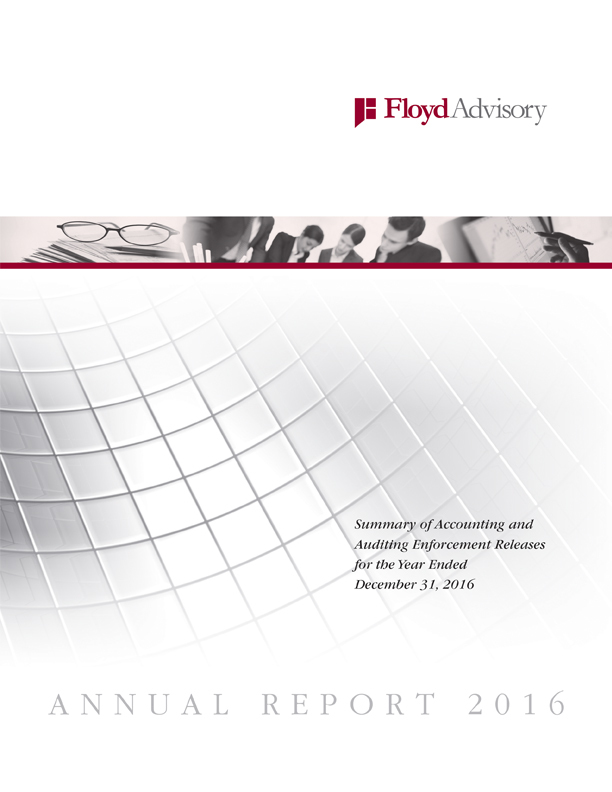 For a printed copy of the report, send your request to info@floydadvisory.com. For questions and comments, contact George Ives at gives@floydadvisory.com. Summary of the U.S. Securities and Exchange Commission, Division of Enforcement’s Accounting and Auditing Enforcement Releases (“AAERs”) for the Year Ended December 31, 2017. 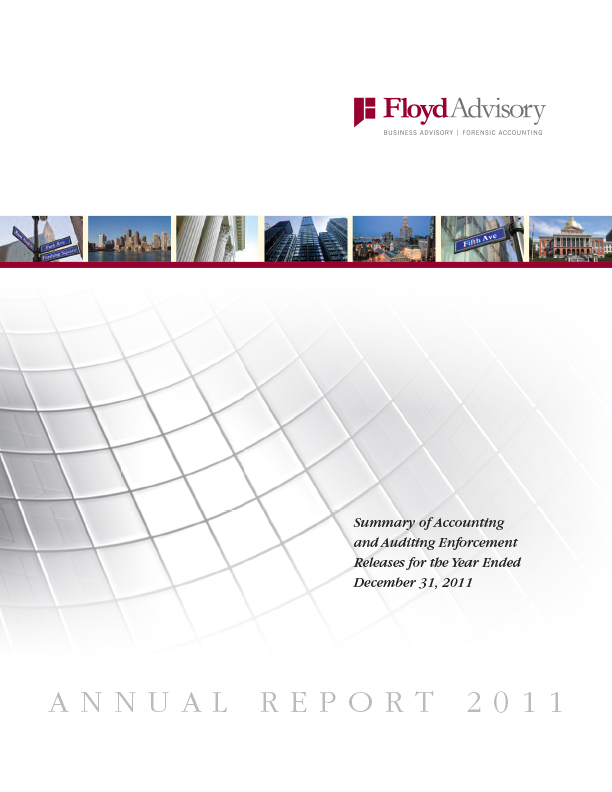 For a printed copy of the report, send your request to info@floydadvisory.com. For questions and comments, contact George Ives at gives@floydadvisory.com. Summary of the U.S. Securities and Exchange Commission, Division of Enforcement’s Accounting and Auditing Enforcement Releases (“AAERs”) for the Year Ended December 31, 2016. For a printed copy of the report, send your request to info@floydadvisory.com. For questions and comments, contact George Ives at gives@floydadvisory.com. Summary of the U.S. Securities and Exchange Commission, Division of Enforcement’s Accounting and Auditing Enforcement Releases (“AAERs”) for the Year Ended December 31, 2015. For a printed copy of the report, send your request to info@floydadvisory.com. For questions and comments, contact George Ives at gives@floydadvisory.com. Summary of the U.S. Securities and Exchange Commission, Division of Enforcement’s Accounting and Auditing Enforcement Releases (“AAERs”) for the Year Ended December 31, 2014. For a printed copy of the report, send your request to info@floydadvisory.com. For questions and comments, contact George Ives at gives@floydadvisory.com. The Annual Report 2013 reveals declines in both SEC Enforcement actions filed and financial fraud-related actions. 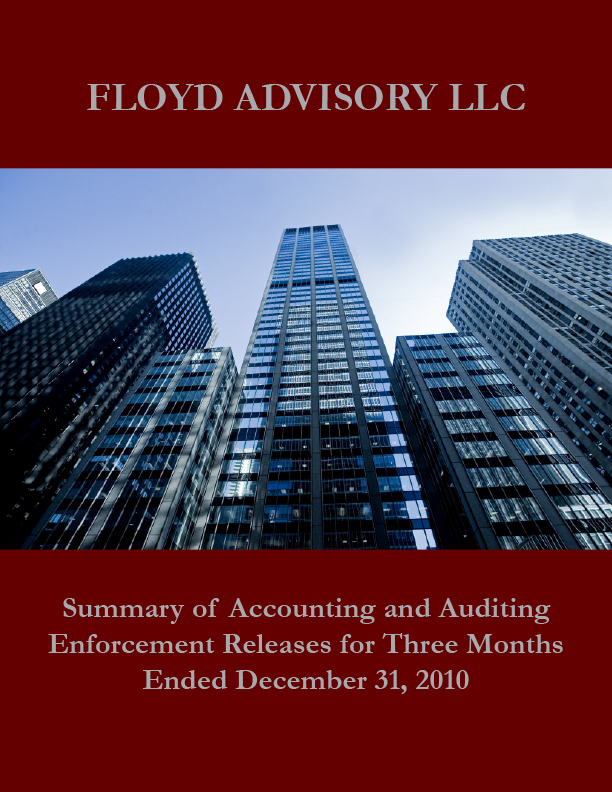 Annual Report 2013, Summary of the U.S. Securities and Exchange Commission, Division of Enforcement’s Accounting and Auditing Enforcement Releases (“AAERs”) for the Year Ended December 31, 2013. For a printed copy of the report, send your request to info@floydadvisory.com. For questions and comments, contact George Ives at gives@floydadvisory.com. 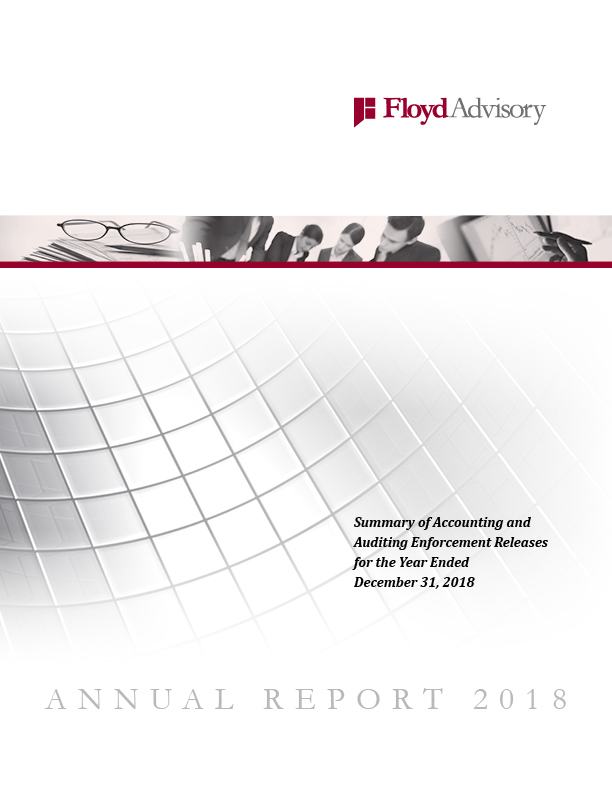 Floyd Advisory continually strives to be one of the industry’s premier thought leaders regarding financial reporting matters, assisting organizations and stakeholders with relevant research and expert insight into today’s fast paced and demanding market.